The following remarks were made by Russ Taylor at the 2006 UNC Physics departmental graduation ceremony. Congratulations, graduates, you made it! Welcome family, friends, and significant others who are here to share the celebration with our graduates. It is wonderful that you are here to cheer them on, but I must tell you that you have no idea what they've had to go through to get here. They have been examined on the nature of the Universe, from the smallest subatomic particles to the largest clusters of galaxies. They have wrapped their minds around hyperbolic cotangents, exponentially decaying probability distribution functions, and other forms of mathematics that are too horrible to mention in mixed company. Graduates, now that you've made it through, I'm here to warn you about some of the dangers found in the Big Bad World and give some advice that I and others wish we had followed along the way. 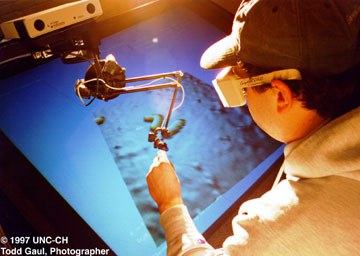 One of our team's publications described a painstaking process to align 3D computer graphics with a robotic force-feedback display to make a combined touch-enabled workbench where scientists could manipulate molecules by pushing on them with a probe microscope. In our haste to make a conference deadline, we published as soon as the system was working. Over the following month, as our collaborators used the system, they asked if we would please introduce an artificial offset between the touch and the visual so that their hand wouldn't get in the way and keep them from seeing what they were doing. We had shown that you could line them up; if only we had waited until we learned that you shouldn't! There have since been at least two other groups who have followed our lead to line up the touch and vision, repeating this same mistake. Avoid unsupported assertions. A frequent mistake made by young researchers is the making of unsupported assertions. My advisor tried relentlessly to beat this tendency out of me while I was writing my dissertation. It seems that the more uncertain I was of a result, the more sweeping generalizations I would make about it. This vice is very easy to spot in the writing of others, but it is insidiously difficult to avoid in one's own writing. Forewarned is forearmed: know your enemy so that you can avoid it. Unsupported assertions pose two hazards. For one thing, they make easy targets for reviewers and so may prevent your papers from getting published. But even worse is the possibility that an assertion gets published and believed and so leads another researcher or perhaps even a whole sub-field down a blind alley. Peer review is a good thing. In 1989, two researchers made front-page news around the world when they held a press conference to present their research on what came to be known as Cold Fusion. Their particular results promised a system that produced more energy than it consumed and that operated at room temperature and pressure. They announced it as a new practical source of energy. They apparently saw this as such an important and valuable result that it should bypass the normal peer-review process by which it could be validated and confirmed. Unfortunately for them, the failure of other groups to replicate their results ended up painting the results as experimental error, self deception, or fraud. Unfortunately for others studying cold fusion, this had the expected quashing effect on their funding and future publications. Unfortunately for physicists, this gave the discipline a black eye. I'm not actually here to debate whether cold fusion works or not; research continues on this topic today. But whether it works or not, the premature press and resulting backlash ruined reputations and squashed funding for a whole research area. By trying to jump the gun, the researchers really shot themselves in the foot. When Vera Rubin looked carefully at the Doppler-shift data from hydrogen clouds orbiting galaxies, she noticed that their orbits did not slow down further from the galactic center as would be expected given the distribution of matter we can see. When she followed up on this, she produced conclusive evidence for the existence of dark matter. It turns out that she was really onto something; it is now believed that up to 90% of the matter in the universe is invisible from Earth. Either that, or our understanding of gravity needs major revision. Jan Oort had earlier found that the orbital velocities in our Milky Way galaxy do not decrease away from the galactic center, but rather than following up he just assumed that better observations were needed. Don't just push aside that nagging result that doesn't fit with your theory, especially if it points towards a systematic error. It may be telling you something important. The Cold Fusion episode teaches us to seek truth, not glory. If you seek glory, you are likely to find neither glory nor truth. If you seek truth, you are more likely to find both. Don't limit your search for truth to what which fits into a particular framework or set of assumptions. If you do, you open yourself up to being scooped by someone out of left field like the patent clerk who proposed the Theory of Relativity or the Catholic Priest who proposed the Big Bang. Einstein freed us from the assumption that time passes at the same rate for all observers of an event. Lemaitre freed us from the assumption that the Universe has forever been as it is today. He proposed that it had a particular beginning in space and time ("before" this there was neither space nor time). If modern Physics teaches us anything, it is that the truth will blow your mind, or at least blow past all the artificial boundaries that are placed in its way. Don't let your theories stay stuck in a box delimited by explicit or implicit false assumptions. Here's one practical way to avoid getting stuck: when you're studying a topic, go to the original sources rather than relying on the accuracy of derivative works. I can't tell you how many references I've seen in papers that point to another paper and claim that it supports a particular fact when it doesn't. This need not be due to intentional misstatement, simple haste and carelessness suffice. Some native American languages have separate verb tenses for eyewitness reports and for all other reports (which are grouped under the category "hearsay"). I recommend using this distinction with regard to the contents of referenced papers. This misquoting is a mechanism by which falsehood can easily pass into accepted truth. 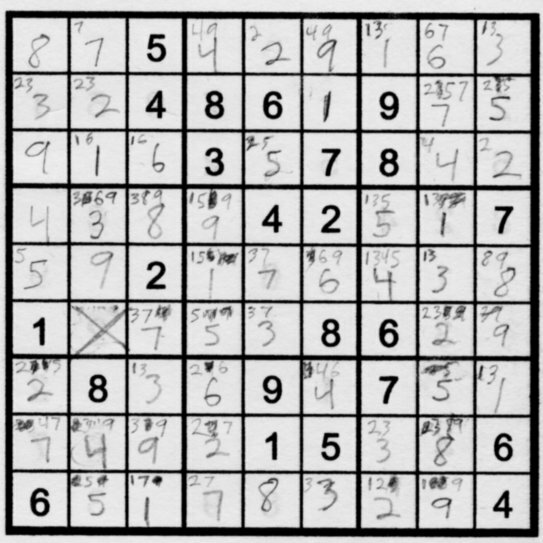 As a Sudoku player, I've experienced the case where one false assumption winds its way through the whole puzzle without showing itself until the very last square. Whole sets of hypotheses can be filled in based on the incorrect assumption without any hint of trouble. By the time the problem reveals itself, it can be impossible to determine which assumption was the incorrect one and it may be faster to throw out the whole solution and start over. It is a big deal when we have to modify entire established and long-standing theories because their basic assumptions were flawed. You want to be the one who notices and corrects the assumption, not the one who lets it slip in unnoticed. Rather than seeking truth, some scientists have succumbed to the lure of wanting to say "I'm right and you're wrong!" This seems to occur between rival groups of theorists, between theorists and experimentalists, and sometimes between scientists and nonscientists. The trouble does not lie in wanting to be right, but in the very human desire to lord it over someone else. It has more to do with pride than with facts, it produces far more heat than illumination, and it seems to be a never-ending source of unsupported assertions from all involved. It seems to me that most of the current conflict and even outright hostility between religious groups and scientists has largely resulted from this sort of behavior coming from both sides. Science and religion both seek the truth, and both assume the existence of an actual external truth to be found. There is no fundamental conflict between these two endeavors, but there are many apparent conflicts caused by fundamental assumptions being treated as proven facts, by overgeneralizations, and by false assumptions. I don't know what the full solution is, but I know that honest people seeking the truth need neither fear nor hate others who are doing the same. If you follow this advice and avoid cutting these corners, I guarantee that at some point in your career you will be scooped by a researcher at another lab. They may have cut some corners of their own, or they may just happen to be slightly ahead on a particular topic. This is one of the costs of careful research that honestly searches for truth. Do not be astonished when this happens, any more than you are surprised that you usually pay more for your health insurance than you get back. The purpose of insurance is to pay a little now to avoid the risk of paying a lot later. On the other hand, if you seek the truth, mind the details, and don't jump the gun, you just might come across results that are so explosive that you win a dynamite prize! Whether that happens or not, you'll be honestly and carefully seeking to expand scientific knowledge. Your reliable results will provide a firm bedrock on which to build new science and new technologies that make life easier for all of us. Enough about possible future accomplishments. We're here today to celebrate hard-won actual accomplishments. Before we present a diploma to each of our graduates, we're going to recognize and present awards to students who excelled in particular areas. To each of you, well done! This is your day. Savor it.